The City of Temecula Community Services Department will present a one-of-a-kind concert event on the steps of the Temecula Civic Center. 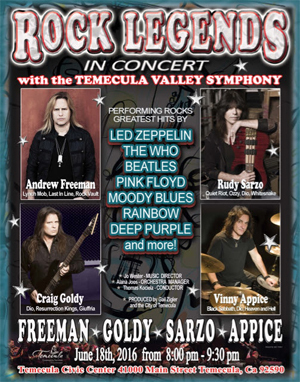 Rock Legends In Concert With The Temecula Valley Symphony is scheduled for on Saturday, June 18th from 8 to 9:30 PM, featuring an impressive line-up of rock legends Vinny Appice, Rudy Sarzo, Craig Goldy, and Andrew Freeman, along with the Temecula Valley Symphony, performing rock’s greatest hits by LED ZEPPELIN, THE WHO, THE BEATLES, PINK FLOYD, MOODY BLUES, RAINBOW, DEEP PURPLE, and more. Thomas Kociela will be conducting this amazing concert. This free event is produced by the City of Temecula under the coordination of Gail Zigler, Sr. Coordinator of Arts, Culture and Events. This production was conceived by Music Director Joey Wester and created with the help of Alana Joos, Orchestra Manager for the Temecula Valley Symphony. Together these three organizations bring this epic event to the steps of Temecula’s City Hall. Plus, the band and symphony will each do some stand alone pieces (to be announced).